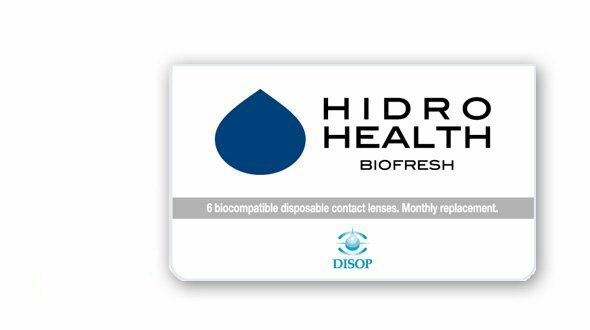 Hidro Health Biofresh Monthly Contact Lenses High quality in your eyes! If you have different graduation, you will have to buy 2 boxes of Hydro Helth monthly contact lenses and you can enjoy glasses for 6 months. Hydro Health Biofresh contact lenses combine high oxygen transmissibility with high hydrophilicity, thanks to Advance Edge technology, so we get a balance between your eye's breathing and your comfort. On the one hand, being a material with a wettable nature, it dehydrates less and provides greater comfort, and on the other hand keeps the oxygenated cornea. We get an excellent result, the eye is well oxygenated, so it will be less irritated and whiter at the end of the day, with dry environments, it dehydrates less so you will not notice dryness in the eye, even with a bearing of many hours, and its edge design makes each flicker soft and comfortable.